What Happened to the Last 10 St. Bonaventure Transfers? Friday was a big day for St. Bonaventure basketball. Dom Welch, the all-time leading scorer in Western New York history announced his commitment at his former high school. Only a few minutes earlier though, rising sophomore Izaiah Brockington let everyone know via twitter that he would be leaving Bona after only one season. This came as a bit of a shock to fans who had extremely high expectations for IZB moving forward. Many thought he would be a starter next year, and some even made bold predictions about him being a future First Team All-Conference player. We’ll never know what his final three years could have been, but it’s hard to deny that Brockington is the best talent to transfer from Bona during the Schmidt era. Let’s take a look at the last 10 to leave the program. * Didn’t include Ndene Gueye since it’s only a few months removed from his departure, but after leaving Bona he transfered to University of Texas Rio Grande. 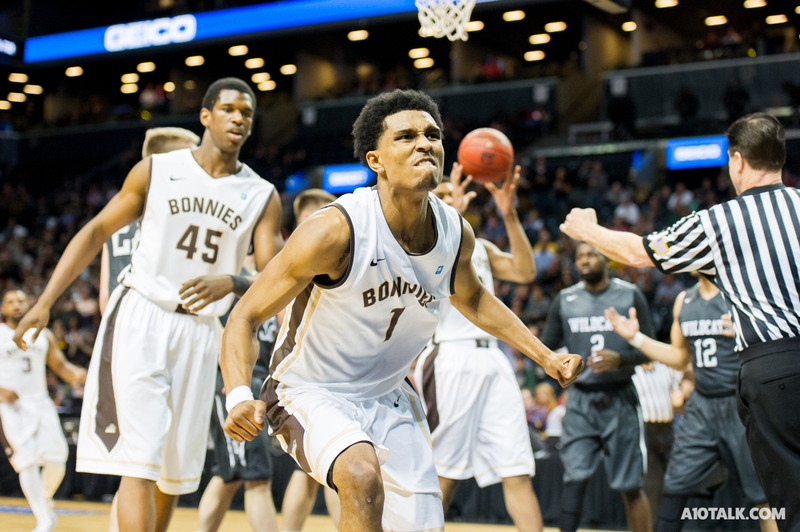 Jordan Gathers was a significant contributor to the Bonnies in his three seasons in Olean. By his junior season, he averaged 26 minutes and 8 points per game, and was a true locker room favorite. After a hip injury cost him the 2014-15 season and he graduated in the spring, the 6-3 combo guard decided to transfer to Butler. At Butler he played 13 minutes per game and had his best game of the year against St. John’s, where he scored 16 points. For Bonnies fans, he will always be remembered for his buzzer beater over St. Louis in the A10 Tournament. Runs played only one season for Bona, where he gathered only 5 minutes and failed to score a point. He then transferred to DII Georgia Southwestern, where there are no stats available on his time there. His Bio does however point out that his favorite movie is Inception, and his favorite music artist is Drake. Jean Yves was another player that entered Bona with many high expectations, but his time was limited to say the least. In two seasons, he played 41 minutes, and scored 18 points. After two seasons, he transferred to DII Gannon in Pennsylvania, where he averaged 15 points and 7 rebounds during his senior year. Gannon only had seven wins that season though, including a 45 point drubbing by George Washington in an exhibition game. After transfering into Bona for his junior season, Alston quickly decided to leave, and headed to West Georgia (Dave Moore’s new team) for his final year of eligibility. Alston entered St. Bonaventure expecting to start at point guard, but was quickly relegated to backup duty due to the emergence of Jay Adams. Alston broke out at the DII school though, scoring 14 points per game, and helping West Georgia take the Gulf South Conference championship crown. Xavier appeared in 22 games in his two years at Bona. During those two season, he averaged less than a point and rebound per game. However, after transferring to NAIA Oklahoma City University, he averaged 30 minutes and 15 points per game in his senior season, where the Stars won 21 games. He also led the team in rebounds (9.2), blocks (2.6), and shot nearly 80% from the charity stripe. Oh, what a difference the level of play can make. The Ohio native transferred from Bona to Georgia State after his sophomore season. Tyson was fairly productive for the Bonnies on the defensive end, and averaged 16 minutes per game in 2015-16. He was unhappy with how he was used at the end of the season though, and left for another NCAA tournament caliber team. Tyson had even lower production though in the Sun-Belt conference, playing only 10 minutes per game and averaging only two points. He played eight minutes and recorded two rebounds in the Panther’s loss to Cincinnati in the first round of the NCAA tournament. Chino never “left” Bona. Instead, he decided not to continue to play basketball, and instead to pursue his Masters degree. Many had high hopes for Chino, especially since he was transfering from Syracuse, and were wondering if he could fill the void in the front court for the Bonnies. He played in only 5 games at Bona before an injury ended his season. In those games he scored only 10 points and committed 15 fouls. Even if he had returned to Bona in 2017-18, it was unlikely that he would have made an impact. Tareq Coburn played only 28 minutes in his freshman campaign at Bona. He then transferred to Hofstra to play for Joe Mihalich. Due to the NCAA transfer rules, he had to sit out the 2017-18 season. But, during the Pride’s preseason trip to Canada, he averaged 5.5 points and 1 rebound per game. It’s really hard to say whether Brockington leaving was the right move without knowing the full reason for his departure. But, if it was strictly playing time, it’s hard to see the logic. The Bonnies are graduating nearly 3300 minutes this year. Even with two guards (and potentially more) coming in, Brockington would have almost certainly played at least 20 minutes per game. Players that play defense as well as he does almost always find the court in Schmidt’s system. Oh well. I’ll be interested to see where he ends up, and wish him nothing but the best. Lets see how Schmidt plans on replacing him. The grass isn’t always greener, too bad about Brockington, he would have really helped us, it’ll be interesting to see where he ends up! This is a bit of surprise. He’ll be a hot commodity.